The Laurier community is excited to welcome over 4,000 first-year students for the 2016/17 academic year. As part of the welcome, Laurier’s Waterloo and Brantford campuses will host a series of orientation events taking place Sept. 5-10. First-year students at Laurier’s Waterloo campus will move in and meet their new Residence Life communities on Sunday, Sept. 4 and Monday, Sept. 5. Laurier’s Brantford campus will welcome first-year students on Monday, Sept. 5. Fall-semester classes will begin on Thursday, Sept. 8 for both campuses. Once students have settled into their residences or off-campus homes, they are invited to join Orientation Week, a weeklong program run by the Wilfrid Laurier University Students’ Union that includes hundreds of senior-student volunteers. 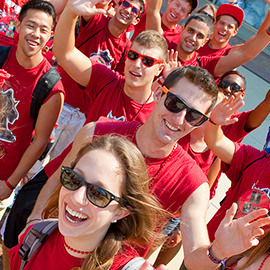 Orientation Week will focus on helping first-year students balance elements of student life, while achieving academic success, enjoying life in the Waterloo Region, and understanding the importance of Laurier’s student body in the community. Key programming initiatives include sessions covering consent, sexual assault and gendered violence, mental health and alcohol and substance abuse related to mental health. Events also include student success sessions; a burn room presentation demonstrating the importance of kitchen and bedroom safety; a pop-up picnic organized by the City of Waterloo; performances by the award-winning Arkells; and, participation in Shine Day, continuing a tradition that started at Laurier more than 50 years ago in support of Shinerama to raise funds for cystic fibrosis. Students can download the Laurier Students’ Union Guidebook mobile app to access an orientation schedule, an interactive campus map and other important information. The guidebook is available for download with iOS, Android and Blackberry devices. Additional orientation programs are also taking place on both campuses. An International Orientation for Laurier’s new international students will take place Sept. 2-5. The Office of Student Affairs, the Faculty of Graduate and Postdoctoral Studies and the Graduate Students’ Association, in partnership with academic programs and departments, will host Graduate Student Orientation events from Sept. 6 to 9. The Laurier Students Public Interest Research Group will run Radical Orientation Week from Sept. 6 to 9.